Copyright © 2019 All Rights Reserved. Musictoday II, LLC, is the seller of all Billy Joel merchandise and is solely responsible for all aspects of your purchase. Own a piece of pop history. 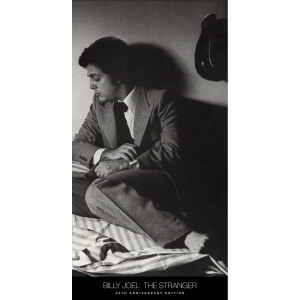 The Stranger is the album that made Billy Joel a household name. Over 10 million units sold, it’s by far his bestselling album. Co-produced with Phil Ramone, 2x Grammy-Award winning, and RIAA Certified Diamond, The Stranger ranked 67 on Rolling Stone magazine’s list of the 500 greatest albums of all time and peaked at #2 on US album charts. The 30th Anniversary Legacy Edition originally released on July 8, 2008 and features the hits "New York State of Mind", "The Entertainer", and "Say Goodbye to Hollywood".